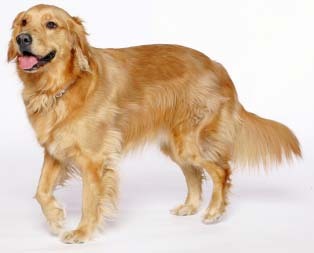 The Golden Retriever was made in Britain during the 1800’s by Lord Tweedmouth whose main aim was to develop a dog who was devoted, considerate, lively and robust. At the same time he wanted a dog that could retrieve in both land and water. Thus we can say that Golden Retrievers are the image of looks and intelligence. Because of the very same reason they are used for a number of purposes which include guide dog for the blind, hearing dog for the deaf, hunting dog, illegal drug detector, and search and rescue dogs. They are fourth most popular family pets in the United States because of their devoted and loving nature.